While Justin Bonomo recently took the top spot in lifetime poker tournament winnings, no one is currently poised to take away Chris Moorman’s crown as the ‘all-time highest online poker tournament winner‘ any time soon. The British poker player recently reached another milestone when he hit the $15 million in online earnings, which will make it difficult for other online poker pros to dislodge him. Moorman has been marking milestones like these for some time now. For example, in 2013, he was the first online player to reach the $10 million mark. He also beat his own record when he won his 26th Online Triple Crown in November 2017. The British online poker pro who now lives in Las Vegas, broke the $15 million mark recently when he won the WSOP.com Weekly Sunday $25,000. He walked away with just $16,929 but it was enough to get the job done. Since then, he has added around $4,000 to his stash. 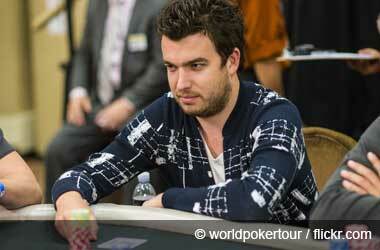 Currently, Moorman has $15,021,323 in total cash-ins since he started his online poker playing career in 2006. With “Moorman1” as his screen name, he has had a long and solid career of playing across a wide variety of sites. Much of his winnings come from PokerStars, having won $7,906,743 on the site. Some of the other sites which have brought him a significant amount of money include Full Tilt where he won $3,842,110, partypoker which generated $1,047,703 for him and the Winning Poker Network where he won $607,560. Besides being a professional poker player, he is also an 888poker Ambassador. Recruited back in June 2016, Moorman has won $328,066 on the 888poker site. In 2017, he branched out into real-world tournament poker by entering the World Series of Poker (WSOP) and won himself his first gold bracelet. This year, Moorman came back to the WSOP and captained United Kingdom’s team for 888poker’s 8-Team Competition. Teamed up with Niall Farrell and Billy Chattaway, the UK team earned 400 points to win the competition, which earned the players a WSOP Main Event package to next year’s tournament. He has also done well on the live poker tour and so far has $5,619,090 in live winnings. His most notable wins in live events were at the 2011 WSOP Europe Main Event and in 2014’s $10,000 No Limit Hold’em – WPT LA Poker Classic Main Event, where he beat 534 players to claim the top spot.